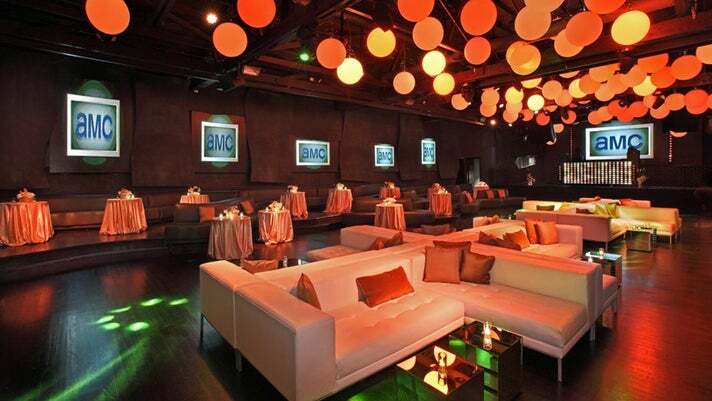 Top L.A. Nightlife Venues for Meetings and Events | meetL.A. Photo Courtesy of Exchange LA. 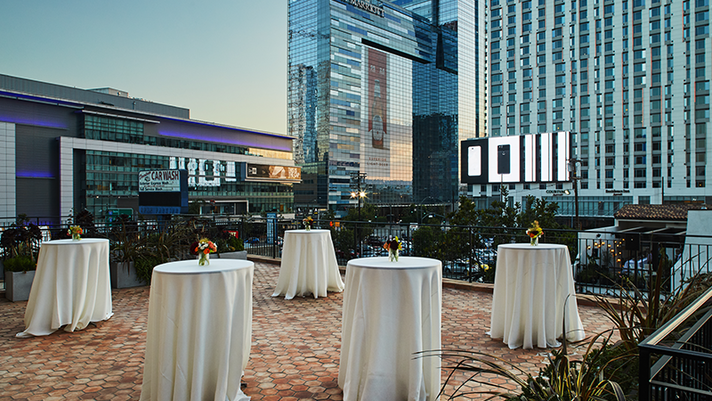 Located in the historic core of Downtown Los Angeles, Exchange LA is a dynamic, high-energy event space, just one mile from L.A. Live and the Convention Center. Formerly the Los Angeles Stock Exchange, this venue pays homage to its rich and opulent Art Deco past spanning 25,000 square feet and four floors. 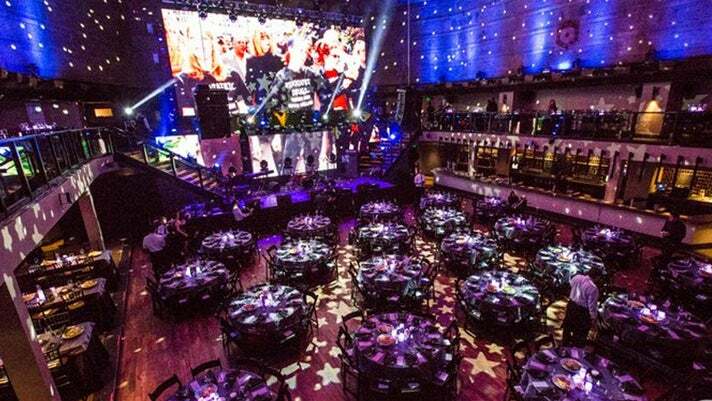 Exchange LA is a vibrant venue that functions not only as a nightclub, but also as an event space for award shows, premiere parties, corporate events, live entertainment and creative meetings. With room for up to 1,500 guests and features LED screen displays, full staging capabilities, convenient valet parking and multiple rooms for breakout sessions or VIP lounges. Photo Courtesy of The Standard Downtown LA. Few hotel pools are as iconic as the one at The Standard Downtown LA, which is likely why Travel + Leisure voted it one of the top 10 hotel swimming pools in the world. Situated on the rooftop, the chic pool area is as hip as it is relaxing and is a popular destination for summertime pool parties. The Rooftop offers panoramic views of Los Angeles and the mountains beyond. There's a heated swimming pool, red AstroTurf deck, dance floor, large film projector, DJ booth, poolside bar, outdoor fireplace, waterbed pods, sculptured topiary and a Biergarten. With 4,750 square feet and 350 capacity, the space can also be reserved by section for corporate outings, private events and outdoor receptions. Photo Courtesy of Lure Nightclub. Located in the heart of Hollywood, Lure Nightclub delivers a decadent dose of glamour wrapped in a luxurious modern design. This L.A. hotspot can accommodate up to 1,700 guests and often hosts world-class DJs and day parties during the summer. Designed by G+ Design, Lure boasts stunning indoor/outdoor spaces with an expansive 18,000 square foot open layout. Upon entering, guests are ushered through a sweeping diamond facade into a wonderland of artistic details. Lure also features oversized cabanas, intricate metal lace work, dark mahogany floors, suede paneling, plush lounge seating and kinetic light spheres that can be choreographed to music. Photo Courtesy of Avalon Hollywood. Avalon Hollywood (formerly the Palace) is truly one of Hollywood’s most historic landmarks. Since it first opened its doors in 1927, it has hosted the likes of Bing Crosby and Frank Sinatra, The Beatles’ first West Coast gig, Duran Duran, Madonna, Nirvana and many more. It continued to gain notoriety throughout the 1970s and 1980s as the hottest nightclub in California, and was considered the West Coast version of the infamous Studio 54 nightclub. Located at the legendary Hollywood & Vine intersection, Avalon can host a wide variety of events from corporate galas and conferences to private parties and product launches. 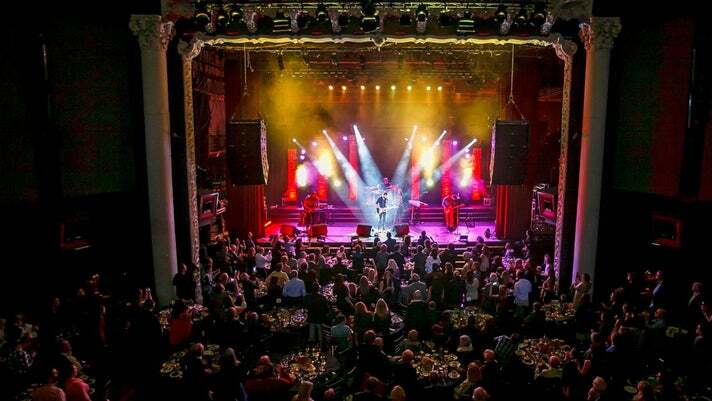 The venue can accommodate up to 2,000 people and boasts state-of-the-art sound and lighting. Photo Courtesy of The Hotel Roosevelt Hotel. Named after Theodore Roosevelt and financed by a group that included Douglas Fairbanks, Mary Pickford and Louis B. Mayer, The Hollywood Roosevelt Hotel first opened its doors in 1927, with a style and service that embodies a modern revival of Hollywood’s Golden Age. Marilyn Monroe was a resident at the legendary hotel for two years and her first magazine shoot was taken on the diving board of what is now the hotel's Tropicana Pool. Today, The Tropicana Pool and Café has been revamped into 1960's-style cafe and bar ideal for poolside indulgence and sun-soaked parties. 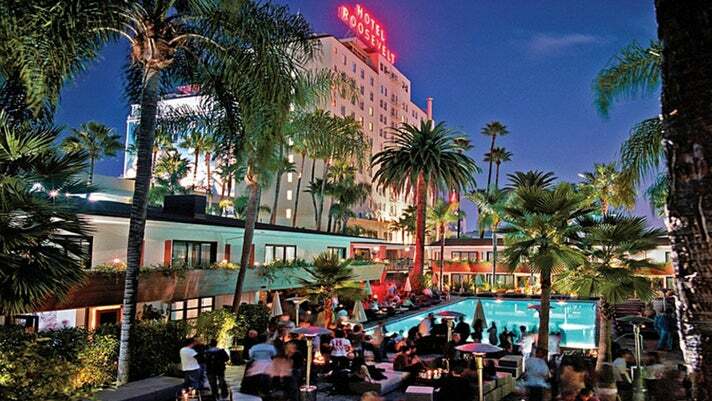 Located in the heart of Los Angeles on the Hollywood Walk of Fame, and steps from the Dolby and TCL Chinese Theatres, its 12-story Tower and poolside Cabanas feature 300 guest rooms and 63 suites, eight restaurant and bars, and a million-dollar underwater mural by famed artist David Hockney. The Tropicana Pool & Cafe can accommodate up to 650 guests and truly sets the scene for a luxurious Hollywood experience. Additional venues for private events include the lively Beacher's Madhouse and their bar/bowling alley hybrid The Spare Room. Photo Courtesy of The Bungalow Santa Monica. 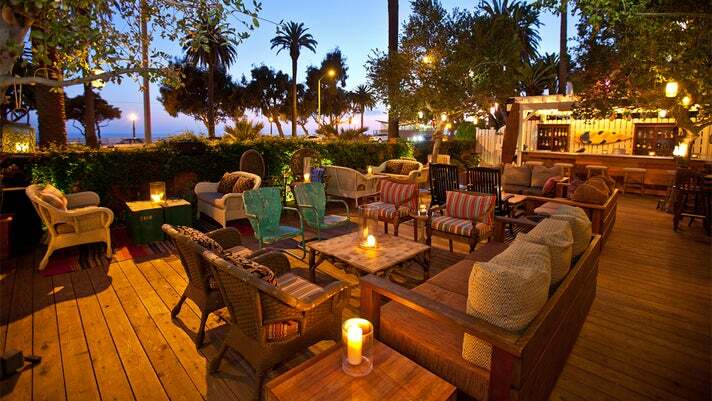 Hold a special event or meeting at The Bungalow Santa Monica, located inside the Fairmont Miramar Hotel. This popular beachside lounge boasts stunning ocean views and is regarded as one of L.A.’s top cocktail bars. There are a number of distinct spaces to mingle within this breezy Baja-style cottage: The Study, a main bar, an outside deck, a State Room and East Garden for private dining, and a game room. The Study is perfect for formal business meetings, and holds 50 for a sit-down dinner or 75 for a cocktail party. The State Room doubles as a private dining room with a hand-carved oak table and white director’s chairs. It opens onto a lovely secret garden as well as an old-school game room with a pool table and French doors. The rustic main bar features a wood-burning stove, solid oak herringbone floors and a soaring ceiling with wood rafters. Guests can also step out onto a sweeping brick patio and aged wooden deck dotted with cozy couches and chairs and covered in twinkling lights. Terrazza at the Hotel Figueroa is a 1,600-square-foot, open-air terrace connected to the Parador and Cabana suites. It features wrought-iron railings, Spanish terracotta tile, and other eclectic architecture that fits the rest of Hotel Figueroa's new vibe. 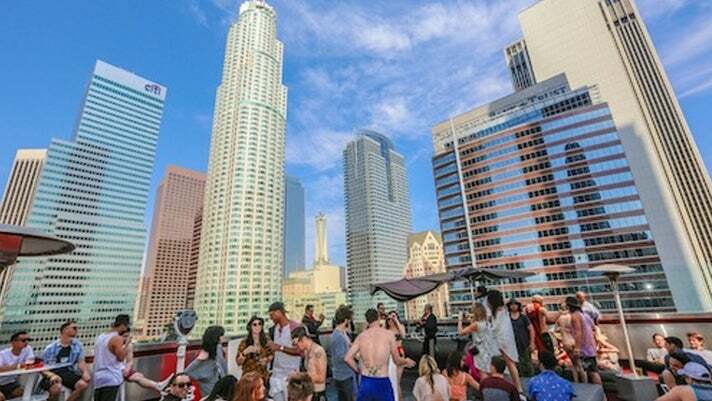 From this terrace, you will be able to see impressive views of downtown LA, as well as have a clear view of the hotel's iconic coffin-shaped pool. This venue specifically can hold up to 100 attendees, with easy access to the rest of the hotel's great features.